Riverside, California has its share of car and truck accidents. With so many freeways converging in and around Riverside, the high volume of traffic that moves through our city is bound to result in serious accidents. When an automotive accident involves a semi truck, it can be even more devastating. The sheer size of an 18-wheeler means that a great deal of force is at work when it collides with another object. If that object is your vehicle, this kind of collision could result in serious injuries, car damage, and huge financial burdens. If you, a family member, or a friend is involved in an accident involving a commercial truck, it is important that to know that you have rights. Heiting & Irwin, APLC has recovered over $300 Million for our clients and understand the ins and outs of laws and issues surrounding commercial truck accidents. We can provide you with support and guidance during this stressful and turbulent time. How Dangerous Are Truck Accidents? An automotive accident is a serious and potentially life-threatening event, no matter what types of vehicles are involved. Nonetheless, accidents involving large trucks such as tractor-trailers or tanker trucks have the potential to compound the damage. So why are truck accidents so dangerous? The fact is, a loaded tractor-trailer can weigh as much as 25 times more than a passenger car! This means that in a head-on collision, the truck will have much more momentum than a smaller car and will cause much more damage. The truck also has more inertia, which means that it will tend to keep moving in the direction it had been moving prior to the collision–sometimes pushing other cars and debris along in its wake. Furthermore, semi trucks sometimes carry freight that may be hazardous or flammable. When the truck is involved in an accident, this material can cause dangerous fumes, a fire, or even an explosion. Finally, the construction of tractor-trailers makes them susceptible to jackknifing, which occurs when one of its components slides sideways and moves out of alignment with the rest of the truck. Although this sometimes happens due to circumstances outside the driver’s control, a slick roadway or inclement weather conditions, or poor driving skills can also contribute. Semi trucks take longer to come to a stop, have larger blind spots, and make wide turns, they require much more skill and care from the driver. A driver who does not exercise the appropriate level of care and responsibility may be found liable to the damages caused. All in all, truck accidents tend to be much more dangerous than a typical car accident and the danger is much more real for the drivers and passengers in the smaller vehicles. 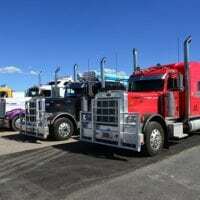 In fact, truck drivers are far less likely to suffer injuries or death in an accident than the people around them. In accidents involving large trucks, 97 percent of fatalities are suffered by people in passenger cars rather than those in the truck itself. A quick look at this map of truck accidents in California shows the large number of collisions that occur in the Riverside area. If you have been in a truck accident in California, you are probably wondering what you should do next. Remember that the Inland Empire truck accident attorneys at Heiting & Irwin are available to answer your questions and help you obtain the support you need to recover. To get started, contact our office and look over our accident checklist. This checklist will provide you with steps to take after you, a family member, or a friend has experienced a collision, such as obtaining information from other drivers, reporting the accident, photographing the scene, and seeking medical treatment. The aftermath of any car accident can be very difficult. After following through with the checklist above, there may be many aftereffects of the crash, which could include damage to a vehicle, towing costs, rental car expenses, injuries, medical bills (past and future), loss of earnings (past and future), and a host of other issues. These items don’t even include the emotional trauma and stress that comes from such a frightening and life-changing experience. Focus on recovery and leave the rest to us. After you talk to one of our attorneys about your truck accident, we will get right to work on your case. Heiting & Irwin-will get to work right away to make sure you receive the support that you need and the compensation you deserve. Your attorneys will investigate to determine that the at-fault party did not exercise reasonable care, and as a result, caused the injury or damages sustained. They will pay. If you have been in a truck accident, do not hesitate to discuss your options with a professional. You do not have to struggle alone with the financial and emotional burdens that come from a serious accident. Call our office today at 951-682-6400 to set up an appointment and learn more about how to proceed with your case. Our attorneys can provide insight and personal representation as you navigate your next steps towards recovery.